We’d love your help. Let us know what’s wrong with this preview of Prince Ribbit by Jonathan Emmett. To ask other readers questions about Prince Ribbit, please sign up. There’s been a lot of talk in the news lately about . . . well, the news. Specifically fake news. Articles and stories that look real when you find them in your in-box or Facebook feed or Twitter account, but that ultimately don’t stand up to scrutiny. According to a December 2016 Pew Research Center Report, 23% of Americans say they’ve shared fabricated reports. The solution? It’s multi-pronged, to say the least, but while digital literacy is a key component, so is the ability to read criticall There’s been a lot of talk in the news lately about . . . well, the news. Specifically fake news. Articles and stories that look real when you find them in your in-box or Facebook feed or Twitter account, but that ultimately don’t stand up to scrutiny. According to a December 2016 Pew Research Center Report, 23% of Americans say they’ve shared fabricated reports. The solution? It’s multi-pronged, to say the least, but while digital literacy is a key component, so is the ability to read critically. That doesn’t just mean online news but also newspapers, magazines, and, yes indeed, books. When I worked as a children’s librarian I would find that teachers would often discourage their students from trusting online information, even if it came through reliable databases, in favor of print resources. Books trump the internet, and while there is good reason for this, I think everyone would agree that there are plenty of books out there chock full of faux facts. Children in the 21st century have to be taught to use their brains when they read. High school curriculum spend a fair amount of time drilling this idea home, but considering how young kids are when they search for information online these days, wouldn’t it behoove them to be taught to think things through from the start? Enter Prince Ribbit, a book that drills home a very simple message: “Just because it’s in a book doesn’t mean it’s true.” Its timing could not be better. It’s a regular sunny day at the castle. Princesses Arabella and Lucinda are mooning over the story of “The Frog Prince” while their younger bespectacled sister Martha searches for an amphibian in the pond’s reeds. Little does she suspect that the frog has overheard her sisters and has hatched a sneaky little plan. Upon revealing himself he declares that he is a cursed prince and only the kindness of the princesses will aid him in his transformation back to human form. Arabella and Lucinda fall for this, hook, line and sinker, while Martha questions the frog’s intent. Yet when she mentions that her scientific texts contradict their fairy tales, her sisters huff back that you shouldn’t believe everything you read. That would be Martha’s point as well, and so she comes to the rather surprising conclusion that the only way to defeat the frog is to understand what she’s dealing with. She plunges headlong into the world of fiction (hitherto unknown to her) and discovers it to be rich with wonder and fun. It also gives her the knowledge she needs to outwit the little frog. Then, ultimately, befriend him. The hero as skeptic is an interesting trope in picture books. To be perfectly honest, they usually don’t fare all that well. Picture books often attempt to instill a sense of wonder and whimsy in their cynical protagonists. Characters like Marshall in Catch That Cookie by Hallie Durand, for example, may question a fantastical situation, but ultimately they’ll succumb to it. Princess Martha is interesting because while she’s increasingly skeptical, she’s also fun-loving and interesting as a person. The first time we see her she’s scrambling in the weeds on a nature discovery. We sympathize with her from the start since we’ve been given the 411 on the frog’s sneaky plan and we find it frustrating that while Martha is right, no one is listening to her. No one, that is, until she uses the power of story against her froggy antagonist. One could argue that the book fails to distinguish between works of fiction or non-fiction, painting everything equally with that “Just because it’s in a book doesn’t mean it’s true” brush. And while I’d agree on principal, notice that all the characters in this book say it in turn. Only Martha is canny enough to realize that if she’s going to get to the bottom of the frog’s situation, she needs to be as well informed as possible. Her sisters find their preconceptions confirmed by the frog’s story and don’t feel any need to question what they’ve read. Martha, in contrast, realizes that you need to read both sides of any story to determine the wisest course of action. In doing so she expands her mind, finds a solution to her problem, and comes out the heroine that you’re truly rooting for at the end. The art of Argentinean illustrator Poly Bernatene is entirely digital but takes care to give the images a great deal of texture. There is none of that unnerving silky smoothness all too common in digital illustration picture book art. Here Princess Martha’s hair has all the wild frizz and curls her sisters lack. She’s pictured with glasses, a kind of visual shortcut used to tell readers that she’s smart (or, at the very least, well-read). The art in and of itself is cartoonish, but Bernatene plays with that by having Martha consult books with very scientifically accurate depictions of frogs, which contrast wildly with the green-skinned hedonist she’s forced to confront. The book isn’t chock full of hidden details, but there were little elements that I appreciated. The dog that pops up periodically to cause trouble. The fact that the servants repeat in several scenes, suggesting that the staff is not as large as one might think. And I liked that for all that the story appears to be set in a “Once upon a time” era, once the girls step out into the town it looks distinctly 1930s, all fedoras and flash-bulb cameras. To be fair, this isn’t the first time that Emmett and Bernatene have tackled the idea of not believing everything you read in a fairytale context. The Princess and the Pig was one of my favorite picture books of 2011 and had many of the same beats as Prince Ribbit. Like this book it featured royalty refusing to face the obvious facts before them in favor of fairy tale wisdom (to often disastrous results). Both books are about willful ignorance in the face of overwhelming evidence to the contrary. They’re about people confirming their own prejudices and what that means for those around them. But the lesson of Prince Ribbit feels more pointed than The Princess and the Pig did. 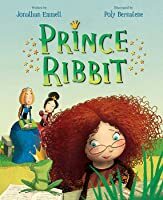 The ultimate lesson may be the same, but Prince Ribbit hammers its point home with the repeated sentence, “Just because it’s in a book doesn’t mean it’s true” in all its connotations. Teaching very young children to take their books' facts on something other than mere faith is a tricky subject, but increasingly necessary. With a steady hand and a working brain, a parent, teacher, or librarian could easily spin this book into a lesson that would ultimately do child readers a world of good. Read carefully. Read critically. Read everything and then form your own opinion from the facts, as best as you can gather them. Or, if you just prefer, read this cute book because it has princesses and talking frogs in it. As far as I can tell, that's a win-win situation. This is a beautiful picture book with characters drawn from the imagination of Jonathan Emmett and fleshed out with the colorful drawings by Poly Bernatene. Not your ordinary and run-of-the-mill Frog into a Prince fairy tale, this one allows the reader to delve deeper into conscious thought and think out of the box exploring the sense that all is not as it may seem and that one can't always trust what is written in every book. On the surface this is a delightful story with a twist on kissing the This is a beautiful picture book with characters drawn from the imagination of Jonathan Emmett and fleshed out with the colorful drawings by Poly Bernatene. Not your ordinary and run-of-the-mill Frog into a Prince fairy tale, this one allows the reader to delve deeper into conscious thought and think out of the box exploring the sense that all is not as it may seem and that one can't always trust what is written in every book. On the surface this is a delightful story with a twist on kissing the frog so he can become a handsome prince. It is the tale of three sisters, all princesses, two of which are engrossed with reading fairy tales and wishing for a handsome prince to marry them - even if it meant kissing a horrid frog first. The young Princess Martha was more interested in real frogs simply because they were frogs and without the hope of one becoming a handsome prince. She peered at the frogs in the garden and spied a clever frog who dreamed princely dreams of soft beds, wonderful food, and a glorious crown. So he devised a plan to present himself to the young princesses. The story goes on that the two day-dreaming princesses wanted to lavish treats on the frog - of course hoping to change him into a Prince. After all, that is how the story in the book went and they wanted the same thing. The adorable and fun illustrations coupled with the story are a sure-fire winning combination and a great twist on the typical frog into a prince fairy tale. I like that the reader (and the person reading to the young child) can think deeper and a bit out of the box on this one. Typically, the young child is taught and expected to believe what the story says and what the adults teach him or her. So to even entertain the thought of a young child not believing something should be carefully approached. Granted, belief a real frog can change into a real human prince is far fetched and can easily be used to teach a youngster that just because it is in a book doesn't make it a truth. Discernment between fairy tales and truth can be taught at an early age. Care does need to be exercised by the adult in the leadership position to carefully maintain the leadership role in helping the child develop the ability to know the difference between that which is true and that which is not. I really like this book and the twist at the end. The story is cute, expressive, entertaining, and brings a bit of educational facts to the reader. The illustrations are delightful, fun, and brightly colored.I can highly recommend it for libraries and homes. Princess Arabella reads her sister, Princess Lucinda, The Frog Prince. They both decide if they ever met a real frog prince, they will both treat the frog like royalty. A frog has been listening to all the fairy tales the girls share. He wants to live like a real prince. The frog pops out of the pond and greets Arabella and Lucinda, but the princesses immediately forget their promises and yell at the frog, “the little beast!” Then the frog speaks. 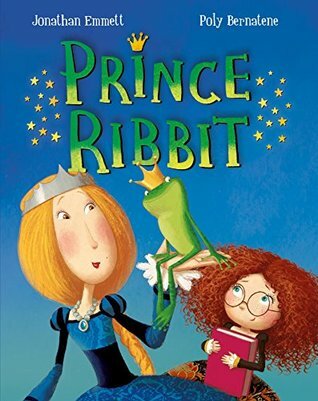 The big message in Prince Ribbit is “just because Princess Arabella reads her sister, Princess Lucinda, The Frog Prince. They both decide if they ever met a real frog prince, they will both treat the frog like royalty. A frog has been listening to all the fairy tales the girls share. He wants to live like a real prince. The frog pops out of the pond and greets Arabella and Lucinda, but the princesses immediately forget their promises and yell at the frog, “the little beast!” Then the frog speaks. The big message in Prince Ribbit is “just because it’s in a book doesn’t mean it’s true.” Martha tries to use this to persuade her sisters that the frog is just a frog, but the older girls use the same quote to Martha and her nonfiction books. Super cute story, that adds a fun twist on traditional fairy tales. This story would be a great way to introduce the genre of fantasy! Emmett, Jonathan Prince Ribbit, illustrated by Poly Bernatene. PICTURE BOOK. Peachtree, 2017. $17. When a frog hops out of the pond and speaks to them, Princess Arabella and Princess Lucinda are sure that he is a real prince, just like in their fairy tales. Their little sister, Princess Martha, is sure that he is a fraud. Is this clever frog playing a trick on them? The illustrations in this book are colorful and are spot on for a fairy tale and I really like the interplay between the sisters. The Emmett, Jonathan Prince Ribbit, illustrated by Poly Bernatene. PICTURE BOOK. Peachtree, 2017. $17. The illustrations in this book are colorful and are spot on for a fairy tale and I really like the interplay between the sisters. The thing I don’t like is the repetition of the phrase “Just because it’s in a book doesn’t mean it’s true”. This seems to be the theme of the book and it just hurt for me to say it every time in a context where it really isn’t the point – especially with the twist to the ending. Without that particular refrain, I would have enjoyed this much more. This review has been hidden because it contains spoilers. To view it, click here. This is a nice take on the well-known frog prince story, which, as well all know, is an complete and absolute fabrication of what really happens when you kiss a 'frog'. But there's plenty of time for disillusionment - this book is for children and we have to bring magic alive for them. Two princesses are reading about The Frog Prince - one of them believes, the other has more than a tinge of skepticism. Then a very smart frog overhears them and hatches a plan for the good life. Princess #1 immedi This is a nice take on the well-known frog prince story, which, as well all know, is an complete and absolute fabrication of what really happens when you kiss a 'frog'. But there's plenty of time for disillusionment - this book is for children and we have to bring magic alive for them. Two princesses are reading about The Frog Prince - one of them believes, the other has more than a tinge of skepticism. Then a very smart frog overhears them and hatches a plan for the good life. Princess #1 immediately pampers him, Princess #2 is wowed by the fact that the frog can talk, but quickly begins to suspect things. When that line first appears in the book, spoken by Princess Martha, I was taken aback (perhaps I should’ve read the insert or the back cover of the book first...). The fairytale lover in me wanted to believe in a fairytale ending along with princesses Lucinda and Arabella, but that unexpectedly profound sentence made me pause. I did not anticipate such subtly incorporated wisdom in a children’s “twisted fairytale” book. Author Jonathan Emmett impressed me further by carefully showing the necessary balance between fiction and nonfiction, fantasy and reality. As well as offering on several other occasions the warning about the truth in printed materials. A great reminder to children —and adults— that the truth is not always as it seems, even in published materials. The beautiful princess always dream of their frog kissing perfect prince. Not Princess Martha! she likes facts, true facts about frogs. She knows that no perfect prince would come out of a frog. Martha's sisters do not believe her! The book allows the reader to learn true facts about frogs and fairy tale facts about frogs. Martha does not end up with a fairy prince but she ends up with a great fairy tale end! Illustrations are colorful, intricate and funny! This fun picture book will get listeners and readers both laughing and thinking. Jonathan Emmett blends fairy tale thinking with a bit of common sense in this tale of a not-so-stereotypic princess and a clever frog. Poly Bernatene's bright, computer-generated illustrations fit the whimsical nature of the tale. It would be a great read aloud for storytime. I recommend it for both public and school libraries. Prince Ribbit, the frog, married the Princess Martha in this colorful and amusing twist of the fairy tale, The Frog Prince. The princesses are reading a storybook that describes a frog a lot like Prince Ribbit. The book explains if she kisses Prince Ribbit, he will transform from a frog to a true Prince. Martha does not believe in this fairy tale and tries to tell everyone that he is just an ordinary frog. Is Prince Ribbit a frog or an actual prince? The quint-essential perfect retold Frog Prince book. I absolutely loved it! The moral of this story is: just because it’s in a book doesn’t make it true. The illustrations are stunning and I don’t mind sharing that I totally pictured myself as Princess Martha. A storytime must! This would pair perfectly with The Frog Prince Continued by Jon Scieszka. This book puts a different spin on the old fairy tale of the Princess and the Frog. I love how smart Princess Martha is but also how she takes time to look at things from her sisters' point of view as well. If you like fairy tales, especially "fractured" or "twisted" fairy tales that tell the story in a different way than usual, you would like this book, too. Interesting way to handle the you-can't-believe-everything-you-read dynamic. Fiction readers need to recognize nonfiction as true. And nonfiction readers can learn to enjoy a story that is not true but is entertaining. Even while demonstrating these concepts, the book is a cute, funny version of The Frog Prince. This is a 2019 Treasure State book. Three young princesses meet a frog that can talk. They do not agree about how to treat him and information they find in various books doesn't give that same ideas, either. They learn that just because something is in a book doesn't mean it's true. This is a new take on a traditional fairy tale. Just because it's in a book, doesn't mean it's true. There are so many layers to this story. being able to enjoy both fact and fiction, imagination and a willingness to learn and experiment can solve a problem, and strong woman can get the man if they want to. This book made me laugh. Also I like that the protagonist has the good taste to wear William Morris patterns. There are art styles within art styles in this book, which makes the visual storytelling richer. What a fun & entertaining twist on the tale of the Frog Prince! Also a great reminder that truth isn't always the only valuable thing, & of course: "Just because it's in a book doesn't mean it's true!" I loved this book! It was clever and unlike any other princess book I read. "You can't always believe what you read in books"
Would be good to use to discuss being critical of everything you read. And in your fractured fairy tale collection! This would be perfect for little girls who have been too immersed in princess stories. A fun variant of the Frog Prince with equally fun illustrations and a very satisfying twist at the end! Adorable, atypical story of the frog who (maybe) turned into a prince! Adorable and laugh out loud funny fairytale starring princesses and a ordinary frog with a surprise ending and a cute repeated tagline- " Just Because it's in a book doesn's mean it's true!" I really enjoyed this picture book. A cute twist on a classic story. Darling illustrations! My students will love this one! Jonathan Emmett was born in Leicestershire in 1965, the son of a factory fitter and a primary school teacher. Jonathan loved books from an early age and some of his earliest memories are of visiting his local library. The picture books that he borrowed then, including Where the Wild Things Are by Maurice Sendak, The Cat in the Hat by Dr. Seuss and Harold and the Purple Crayon by Crockett Johnson have had a great influence on the picture books that he now writes. It was while Jonathan was at college, studying architecture, that he first started developing his own illustrated texts, illustrating poems and lyrics that he’d written. Pleased with the results, he found himself spending more and more time on writing and illustration. Although he qualified as an architect, he found the job unsatisfying and began pursuing a career in children's books in his spare time, eventually going full-time in 1995, a few months before his thirtieth birthday. As well as writing picture books such as Bringing Down the Moon, Someone Bigger, Pigs Might Fly and Ruby Flew Too, Jonathan also writes and paper-engineers pop-up books. His books have won several awards including the Red House Children’s Book Award “Book for Younger Children” for Pigs Might Fly and the Kiekeboekprijs for Bringing Down the Moon. He now lives in Nottingham with his wife, Rachel, and children, Max and Laura.